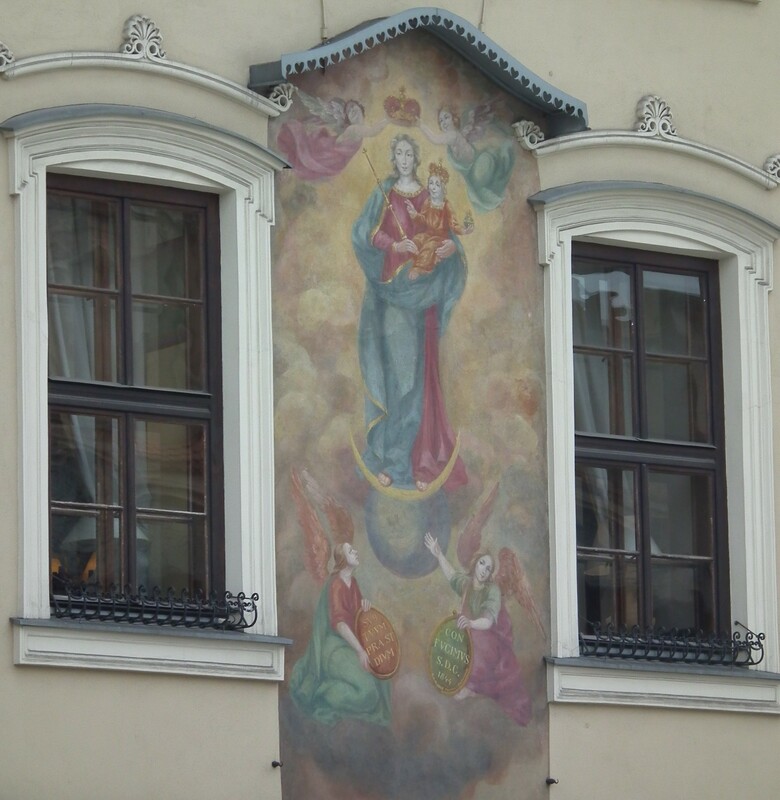 The citizens of Krakow are deeply religious and there are about 140 churches in the city to prove it. 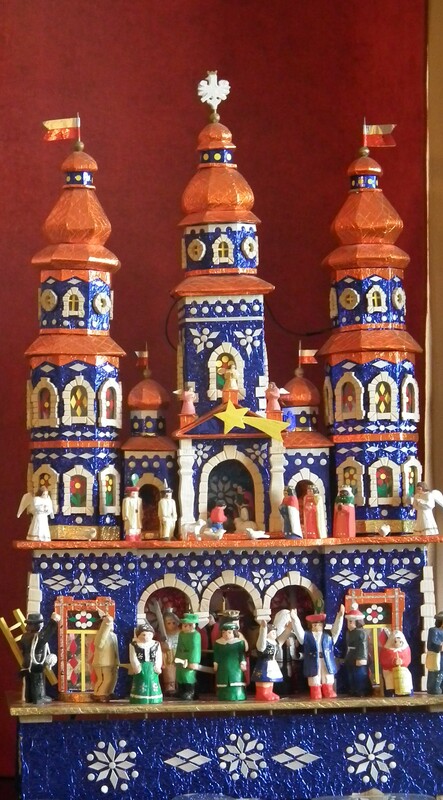 I love the beauty of any place of worship and have seen many. 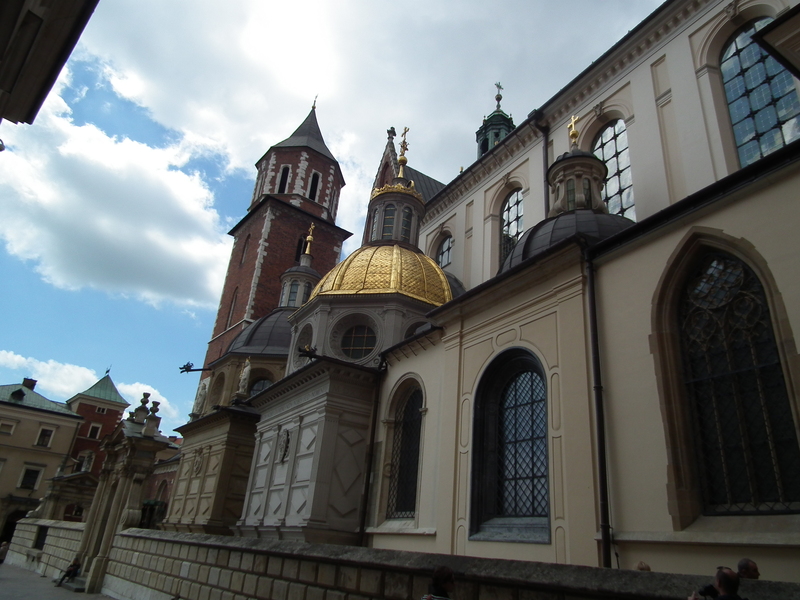 But in Poland I was always surprised of the number of people quietly praying any time of the day that I happened to walk in. 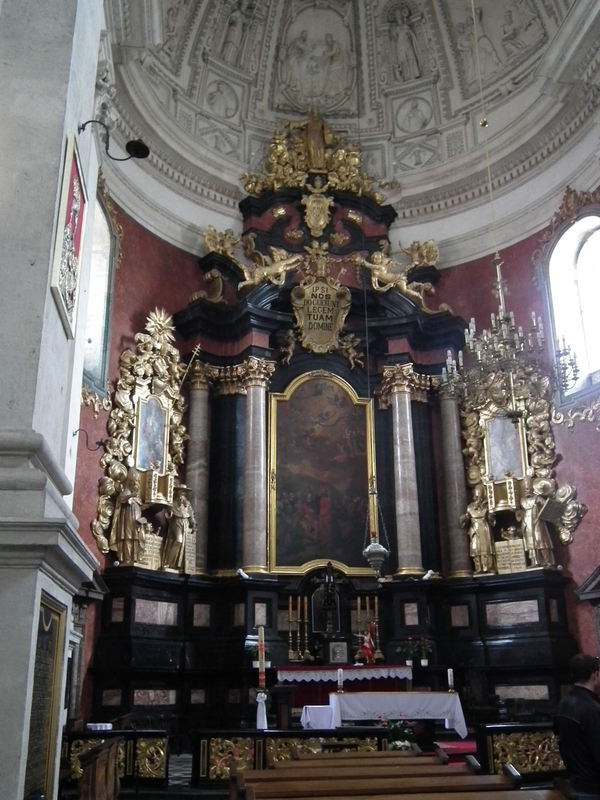 Saints Peter and Paul Church caught my eye especially because of the 12 statues ( 11 apostles ( Judas excluded) and Mary Magdalene) lining the entrance of this baroque design built in 1605. 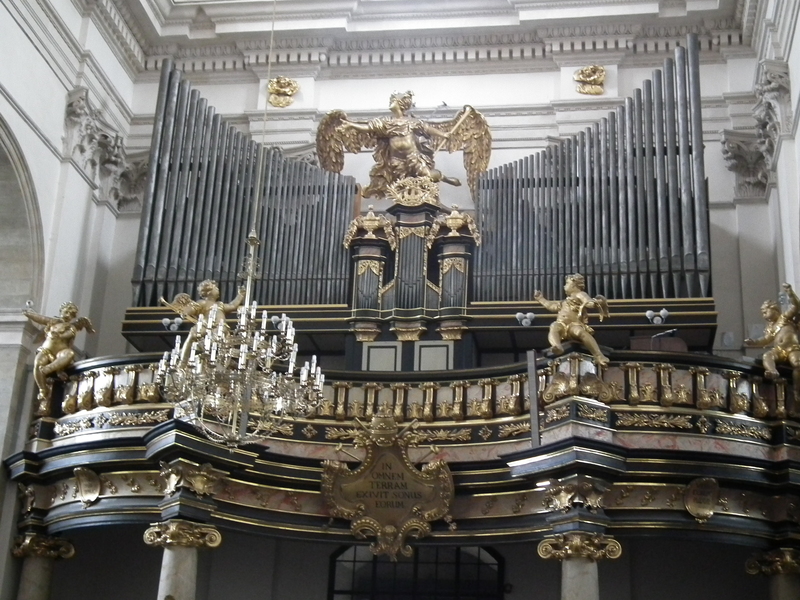 Corrine and I also attended a wonderful concert here. 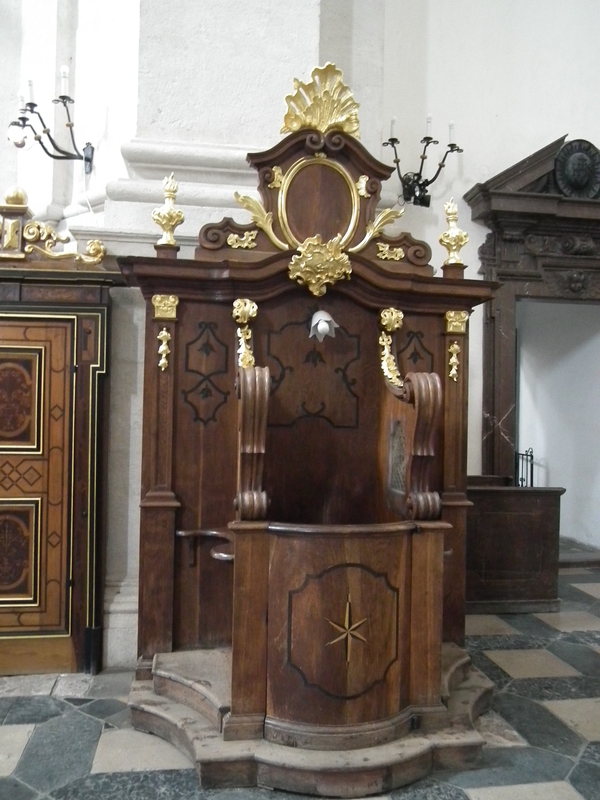 I found it interesting that there was such a fancy confessional for sinners. 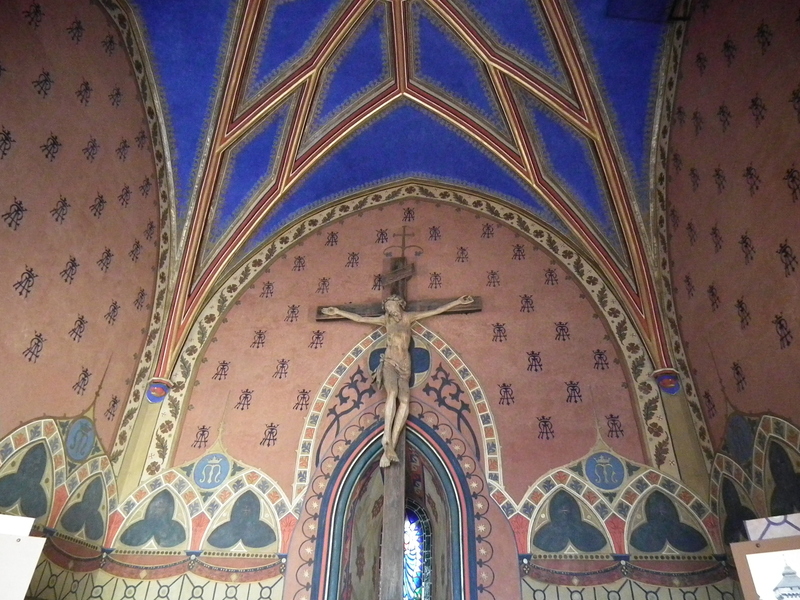 Another interesting church I came across was Barbary Church ( 1338) with it’s beautiful ceiling and it’s Gothic confessional. 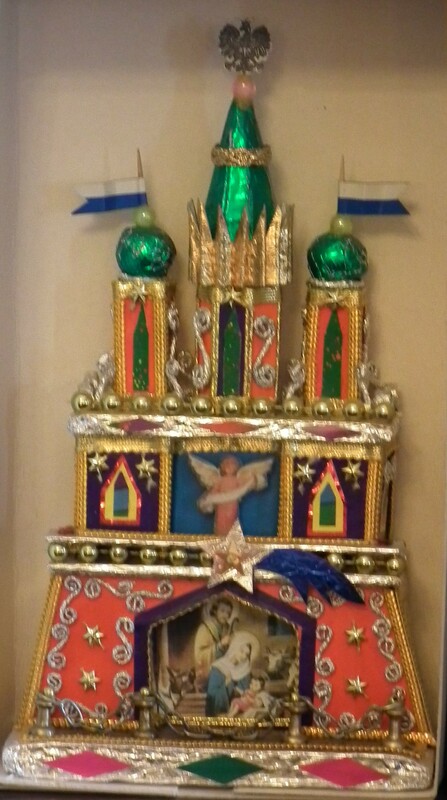 It also had a ” cemetery chapel” on the outside of the church. 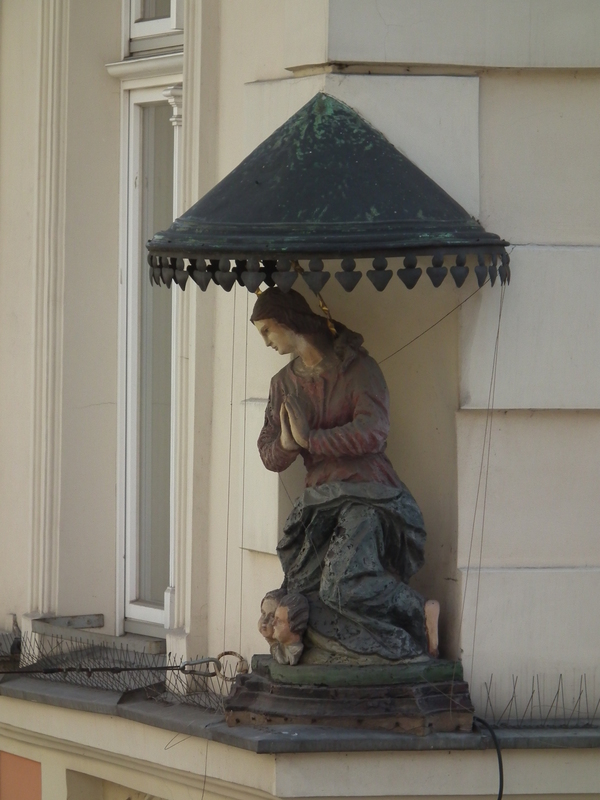 The chapel was not accessible but had statues inside depicting the Prayer in the Garden. The statues themselves were not very recognizable, maybe due to age and the screening around them. 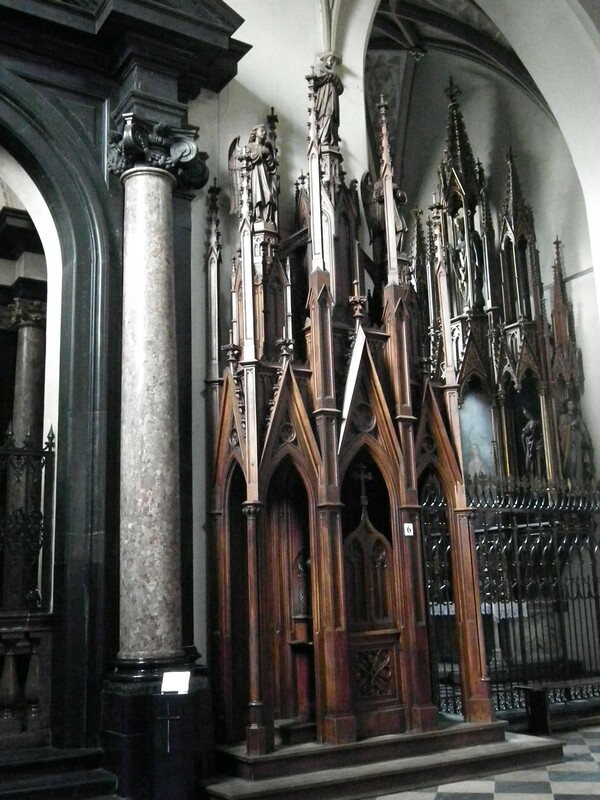 This photo is from the internet of the cemetery chapel – it sat in the shadows when I was there and I couldn’t get a decent shot. 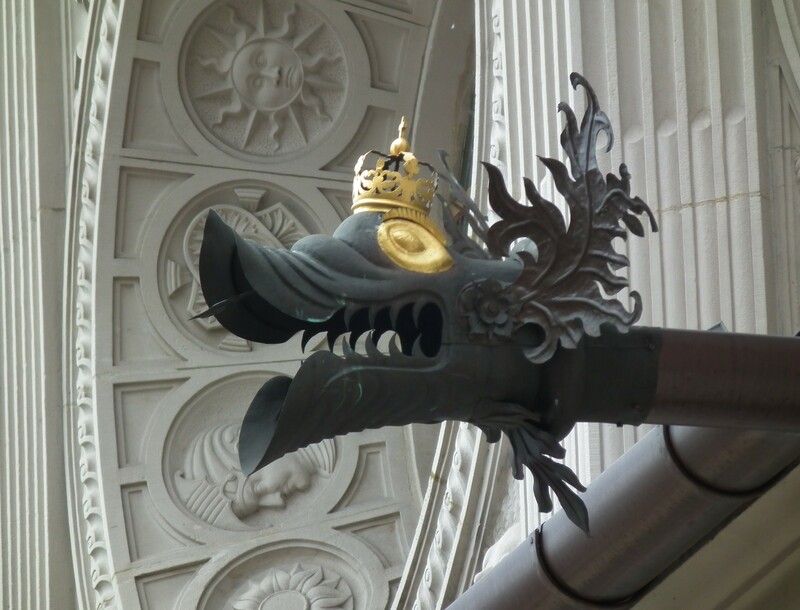 You gotta love the royal downspouts of the past. 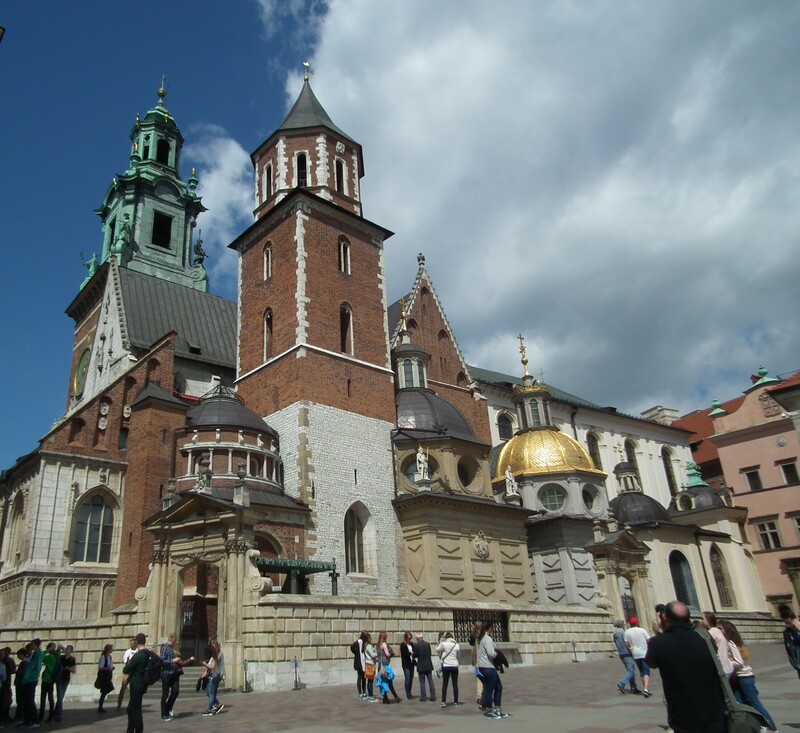 Wawel Hill is a most important cathedral and castle complex in Krakow, Poland. 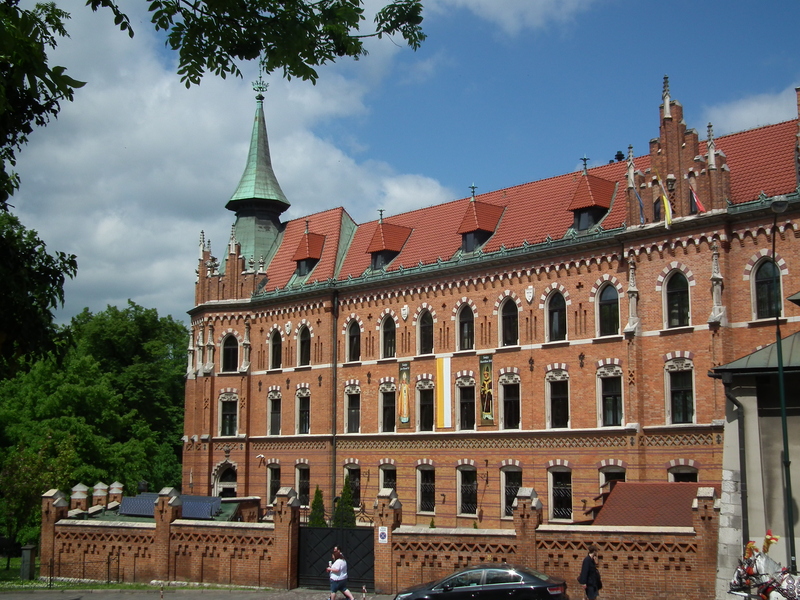 There has been a castle on this hill since Poland’s recorded history, and according to legend, a fire-breathing dragon lived in the caves under the hill before that. 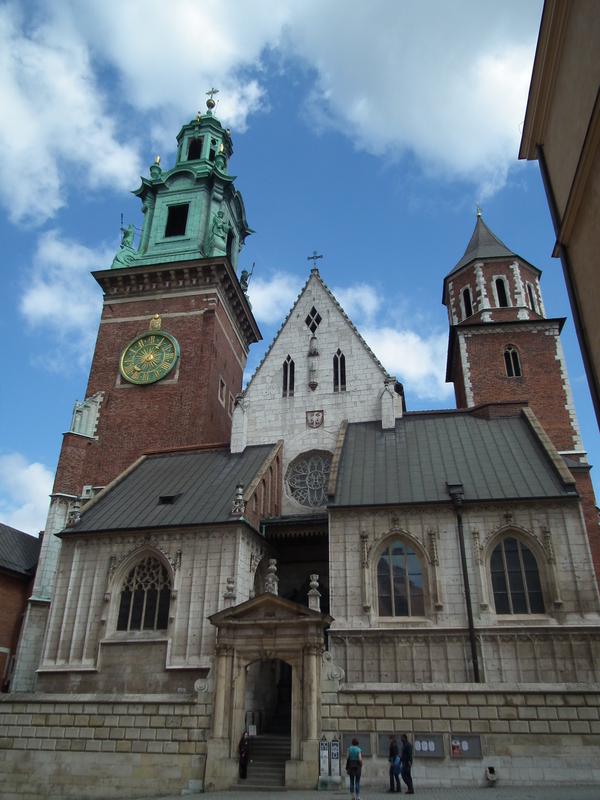 Wawel Cathedral is the national church of Poland. 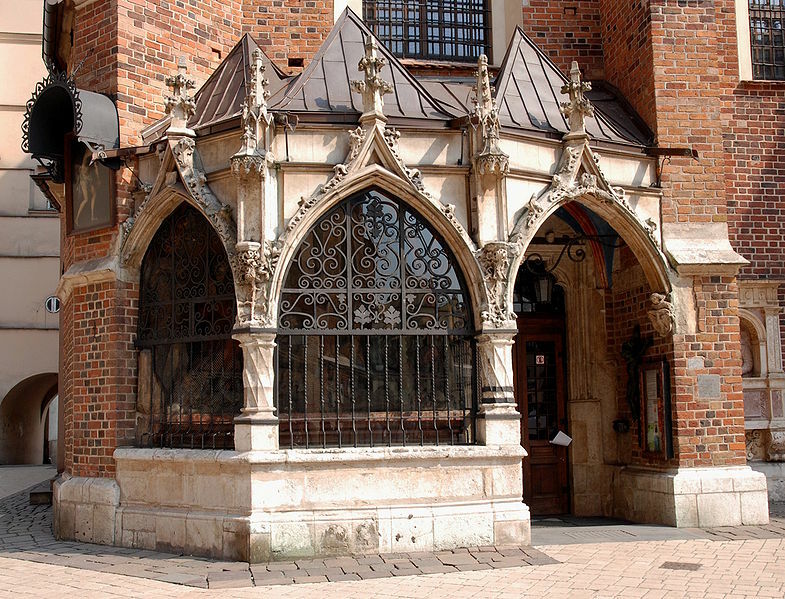 It also is home to the tombs of Poland’s most important rulers and historical figures, including the much loved King Kazimierz of Poland’s 14th century. 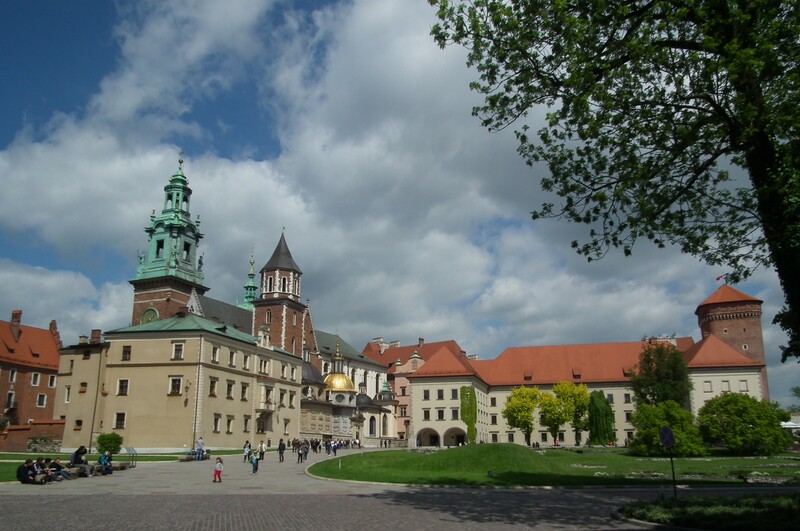 Wawel Hill is the most visited sight in Poland. 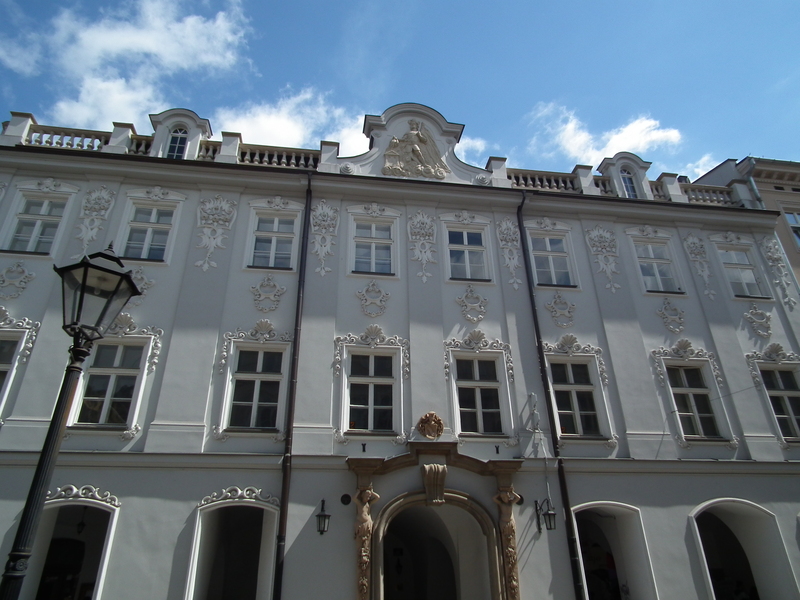 It takes effort and patience to try and decipher the different buildings and add on’s in this complex. 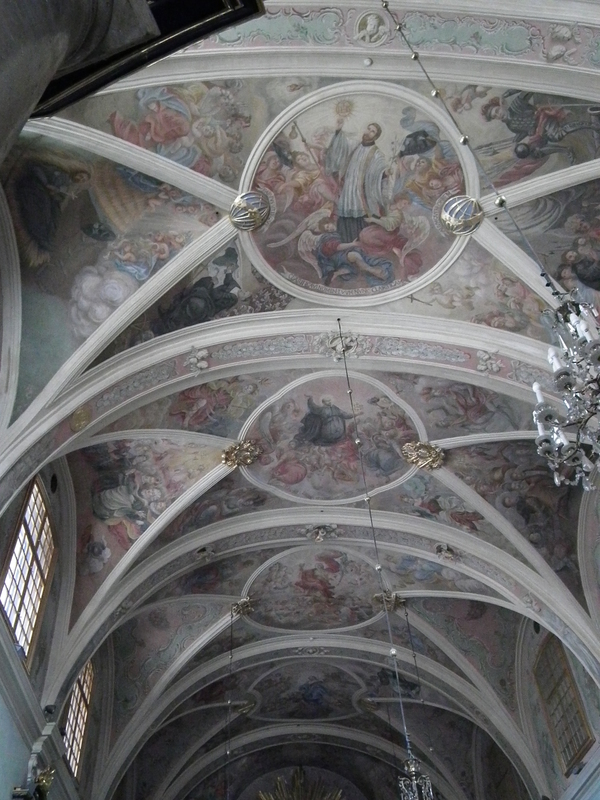 The white building tucked in the middle is the original part of the cathedral and , over the centuries, 20 or so chapels have been added to an outcome of many assorted styles of architecture. 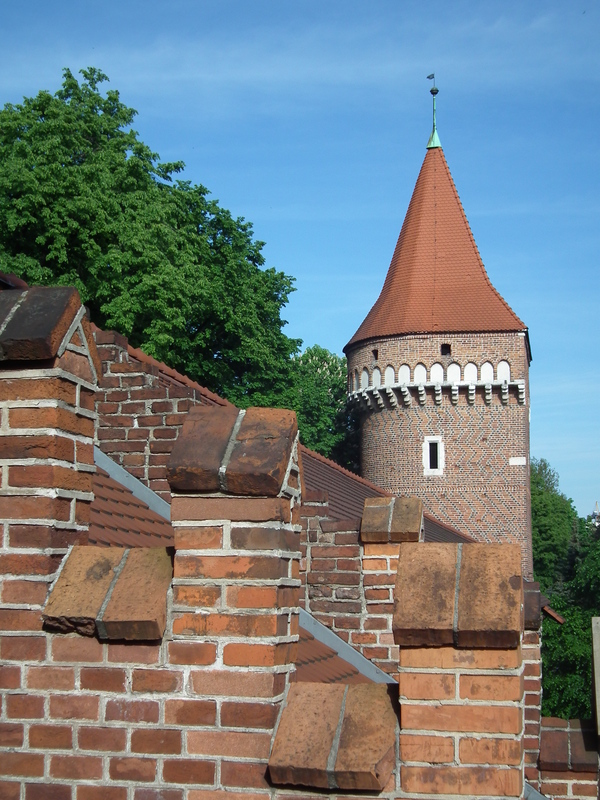 The castle now holds several museums and one of the towers is available for climbing. As a side note, the Hindu concept of Chakra believes there are seven chakra points on earth where a powerful energy field is concentrated. In one corner of the castle’s courtyard is, supposedly, one of those seven points. 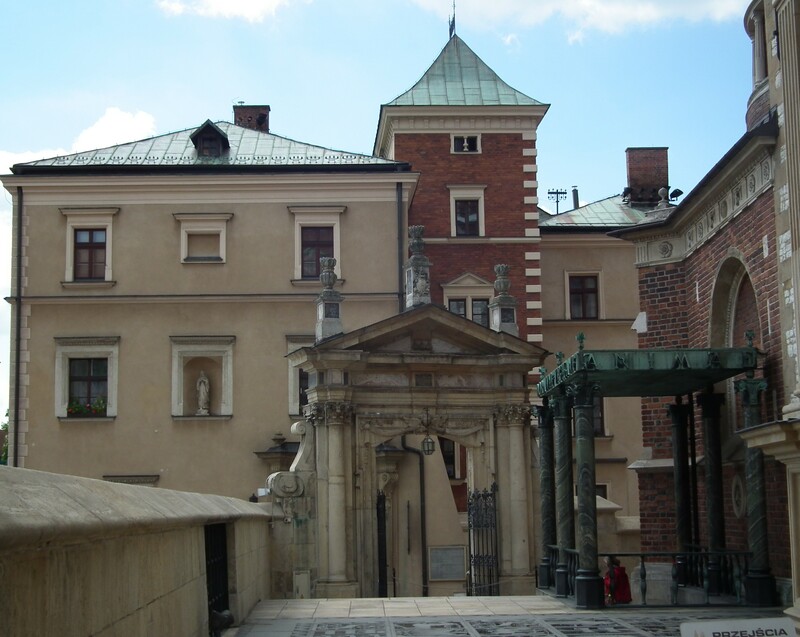 The Wawel administration will not discuss the belief and has done it’s best discourage Chakra-seekers by blocking off the point from the public. It was a wonderful day to enjoy and marvel at the beauty and complexity of all the buildings hugging each other like a Lego creation …..or maybe I was feeling the effects of the Chakra. 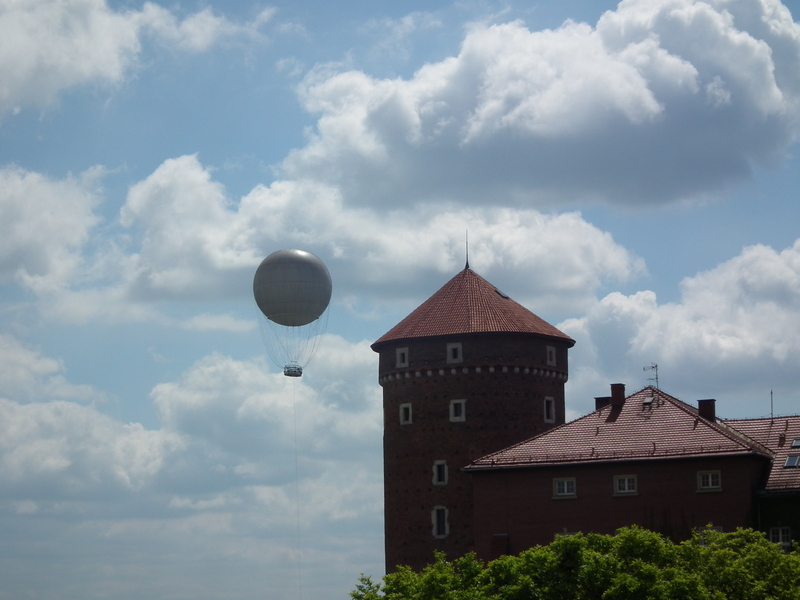 What a surprise to see a Hot Air Balloon also! 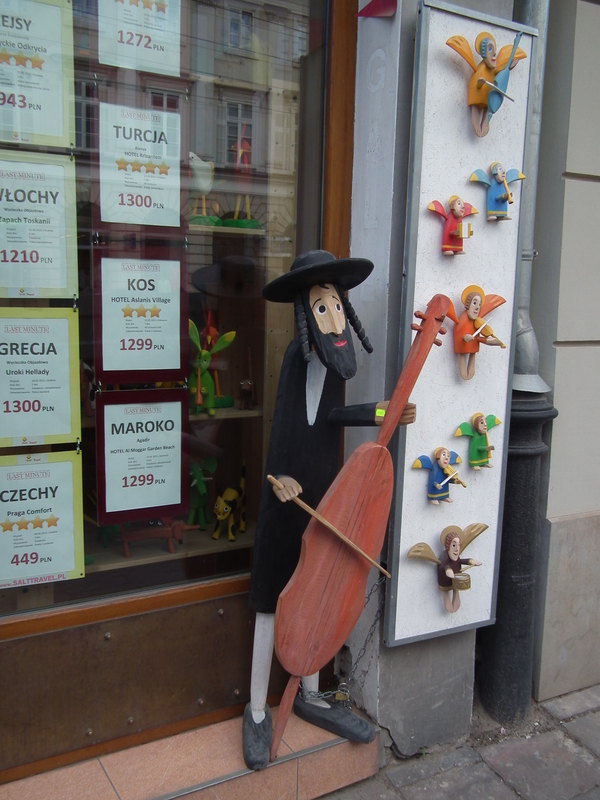 Another interesting neighborhood in Krakow was Kazimierz . 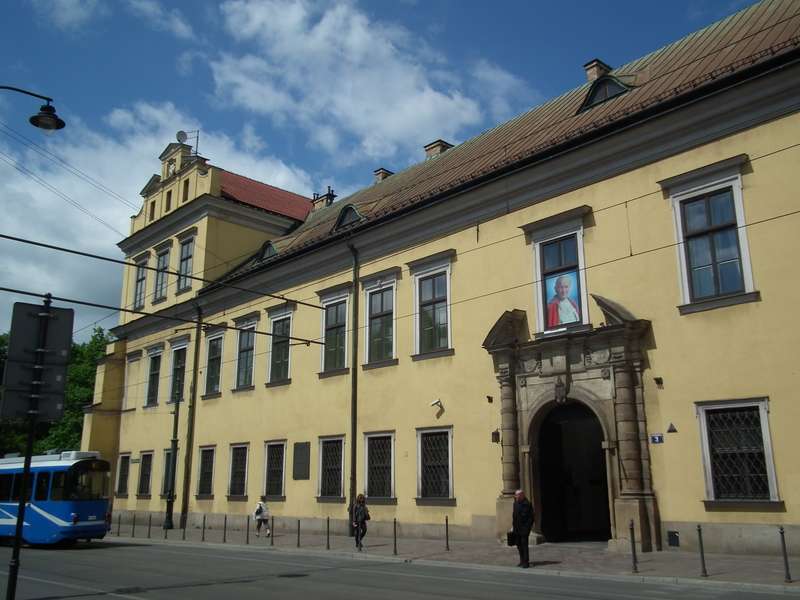 It was the home of the former Jewish community long before WWII. 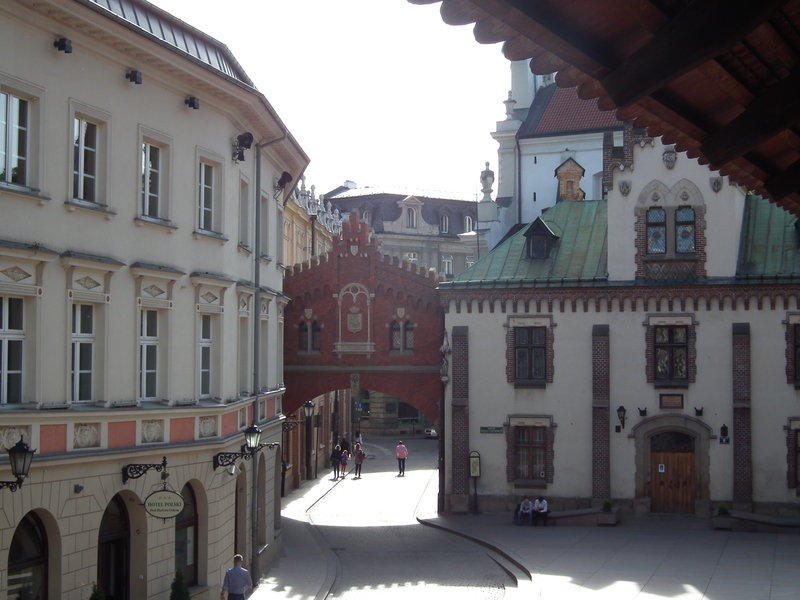 At the time of WWII , 65,000 Jews lived in Krakow. 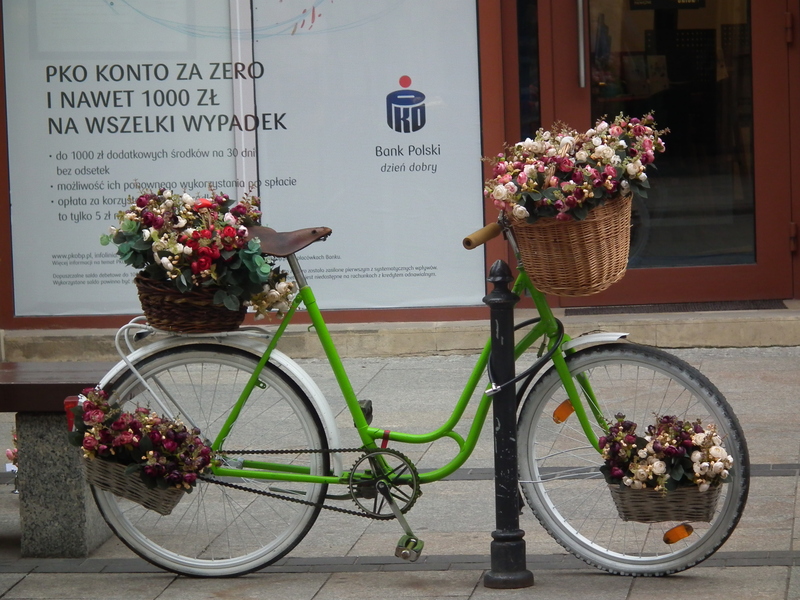 Only a few thousand survived the war and even a fewer number live in Krakow today. 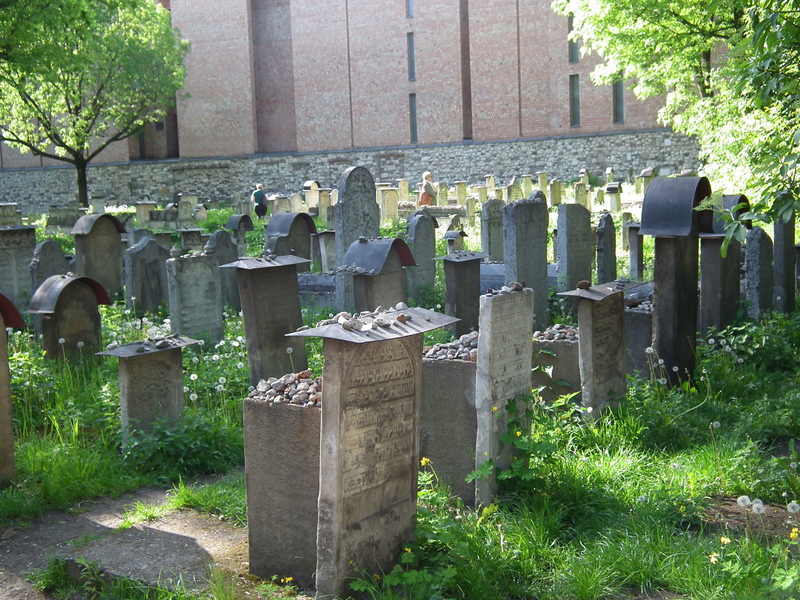 Kazimierz has 2 Jewish Cemeteries. 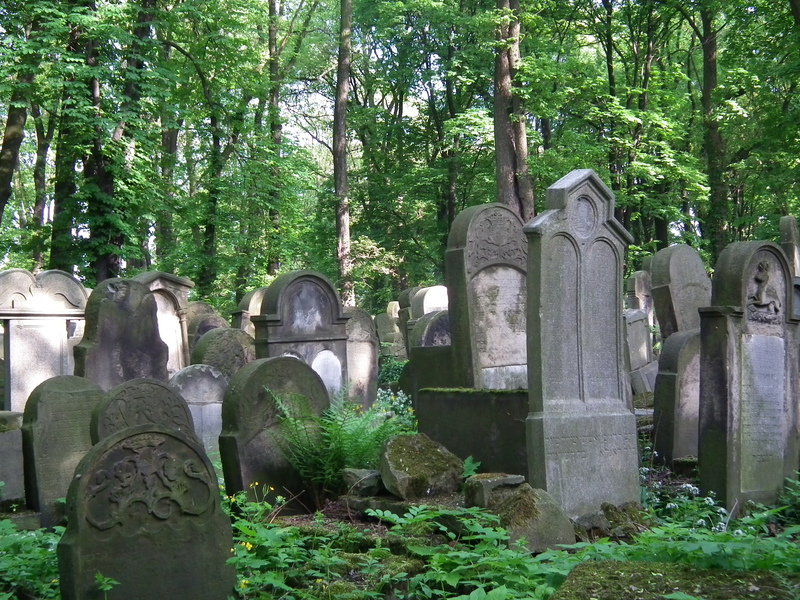 The Old Cemetery was used for burials from 1552 to 1880. The New Cemetery opened in 1880. WWI I started in Poland in 1939. The Nazis desecrated both cemeteries, even using gravestones as pavement in their concentration camps. 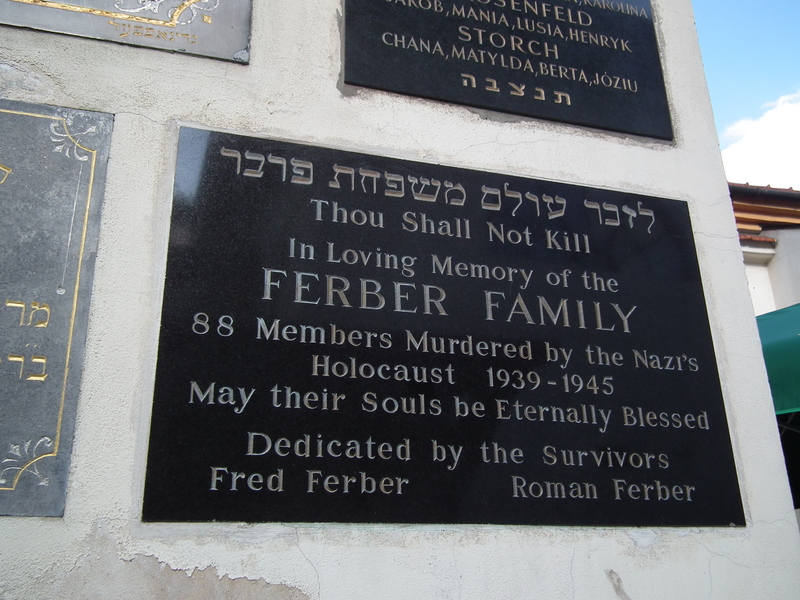 Both cemeteries were repaired in the 1950’s and the gravestones that had been shattered by the Nazis was made into a wall around the Cemetery. 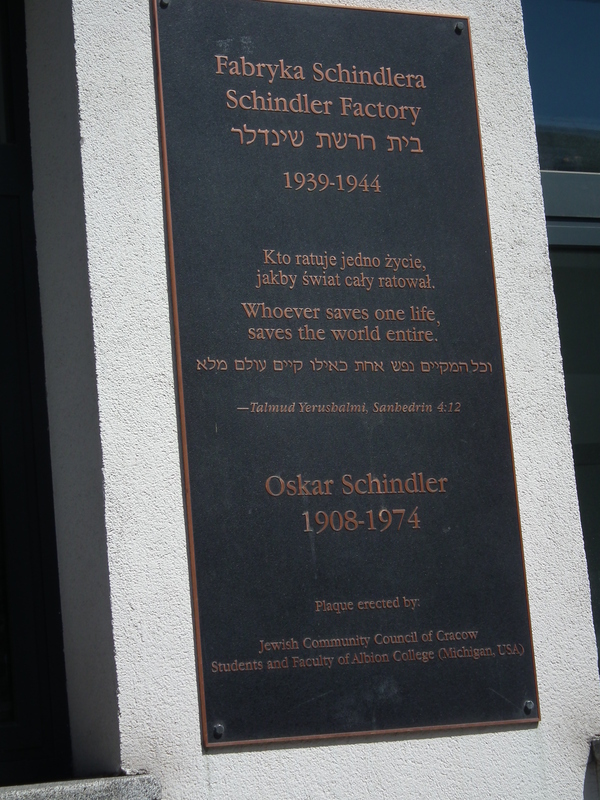 Schindler’s Factory , where he worked and where much of the movie was filmed, has now been made into a Museum . 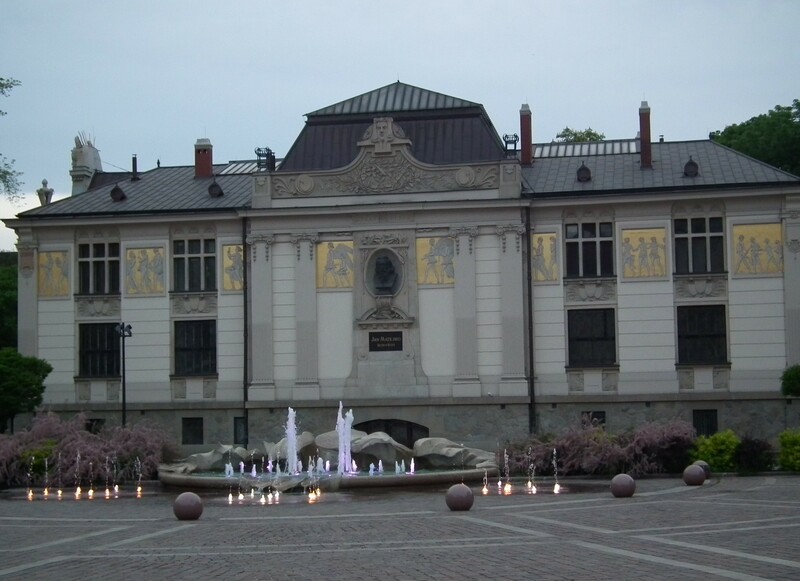 The Museum explains the war’s affects on Poland and about Schindlers story. 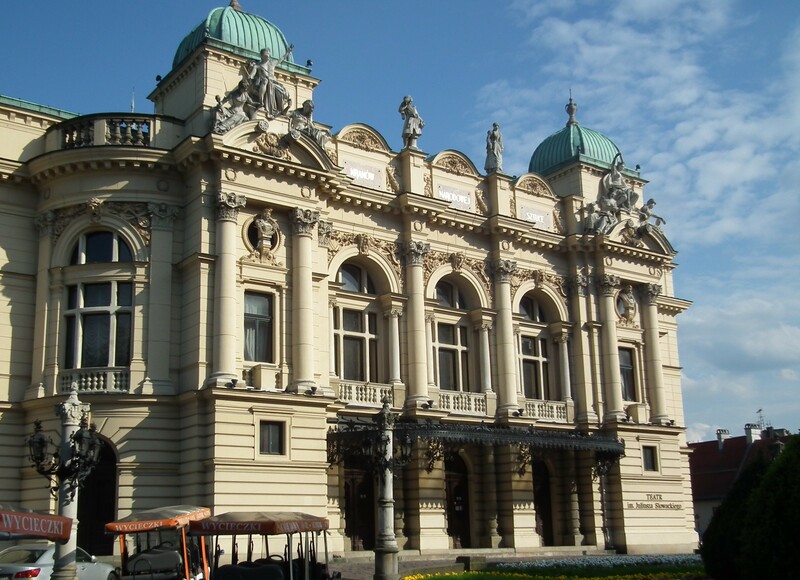 Photos of many of the Jews that Schindler saved were hanging in the front of the museum. 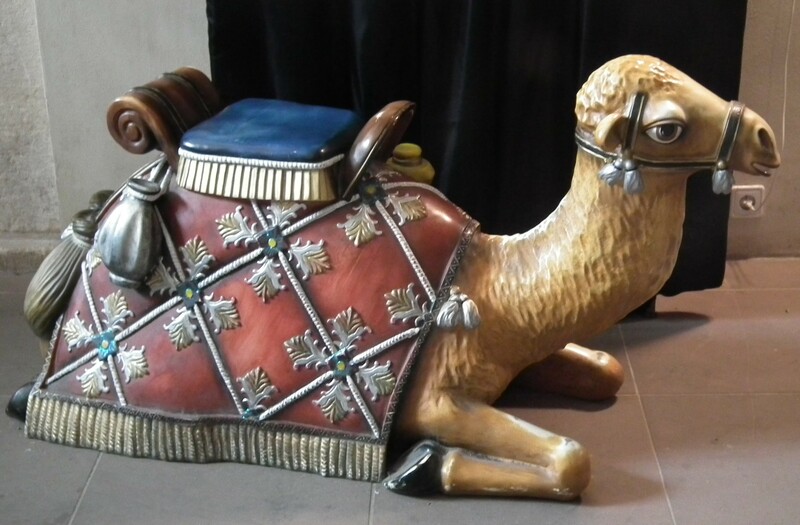 To say the museum’s contents were disturbing is an understatement. 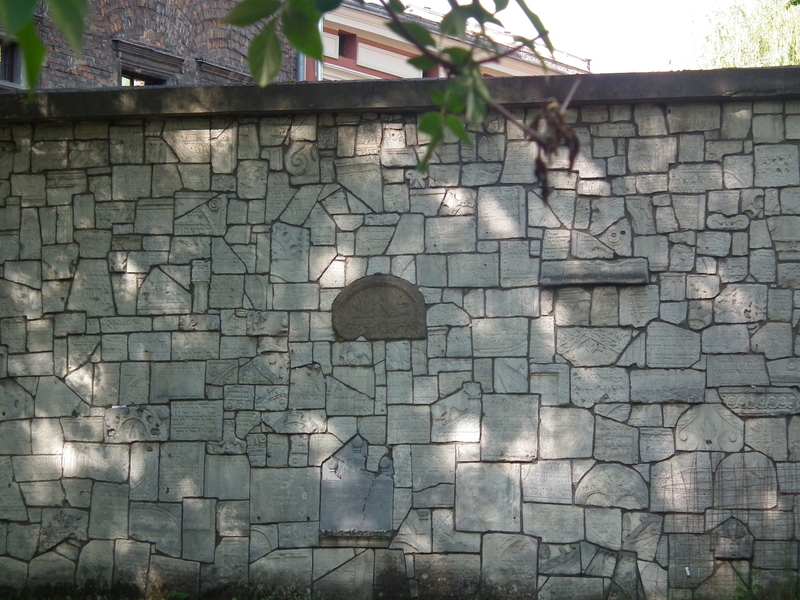 The mosaic wall made from shattered gravestones at the Old Cemetery. Some signs at the Cemeteries can bring tears to your eyes. 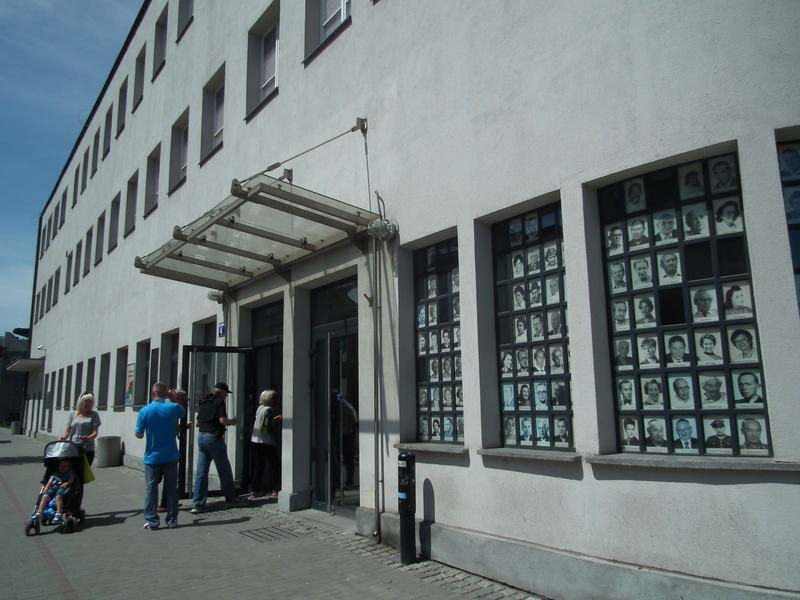 Schindler’s Factory with photos of some of the people he saved in the window. 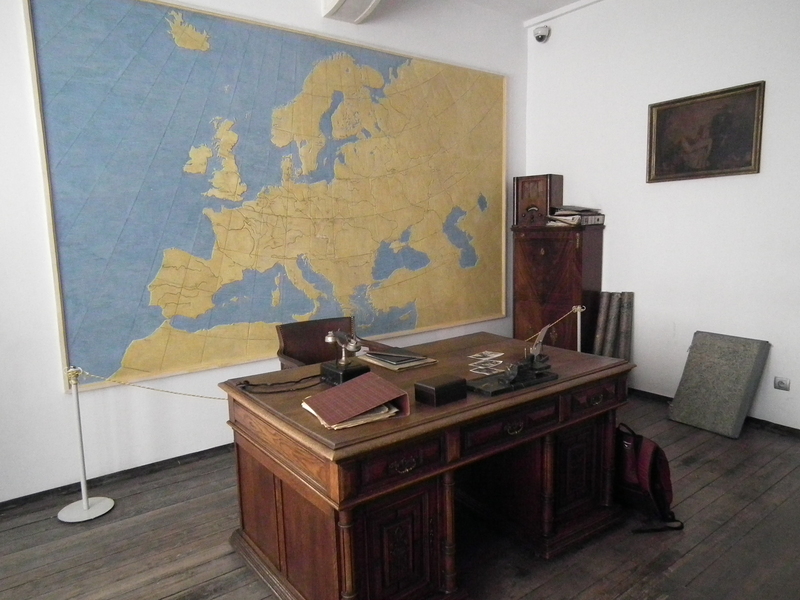 There were rooms and rooms of photos of Poland during the war and of how the Jewish community was treated and tortured and murdered. Also many photos of the war equipment used during that era. 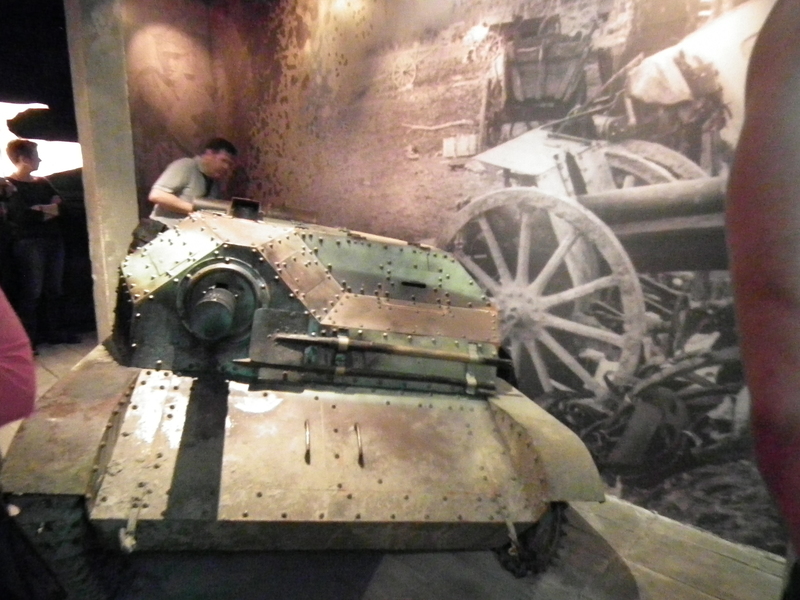 This real tank from WWII struck my emotions the most of the equipment. As you can see by the man in the back of it, the tank is small and looks like a tin can. Hard to imagine it was of much protection. 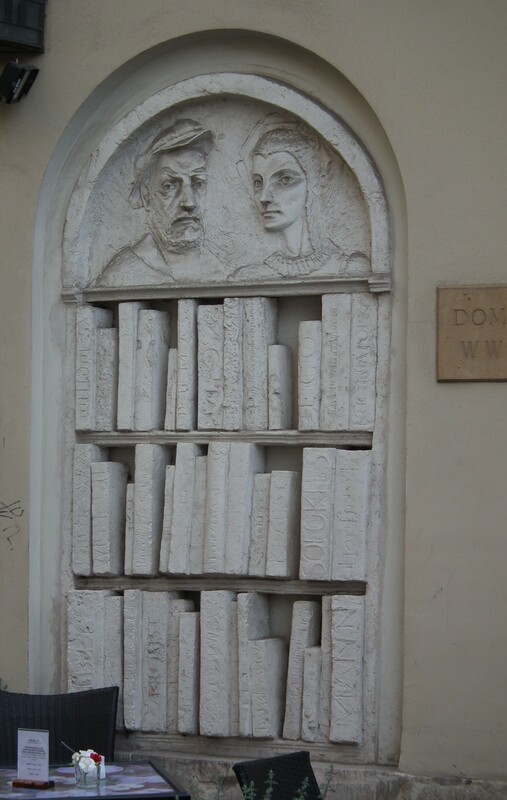 Carving in a wall outside a café. 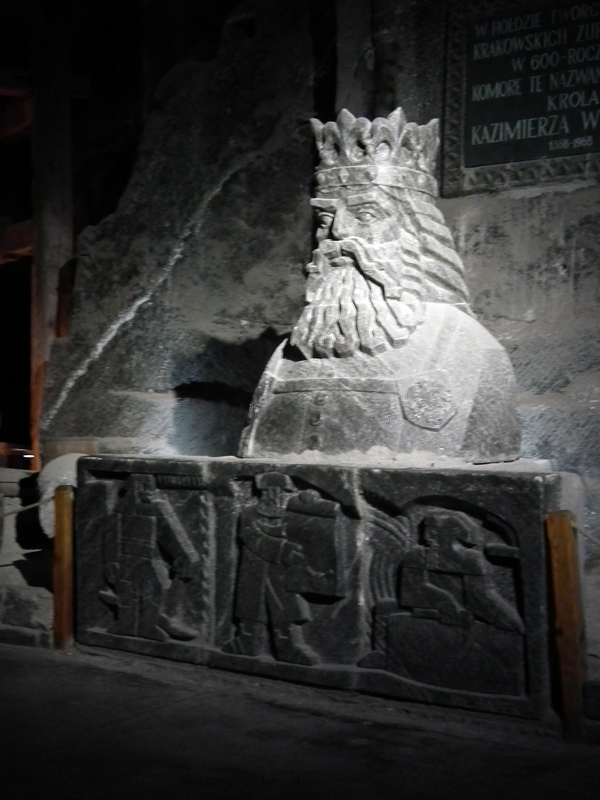 King Kazimierz the Great – Poland’s highly respected King from 1333 to 1370. 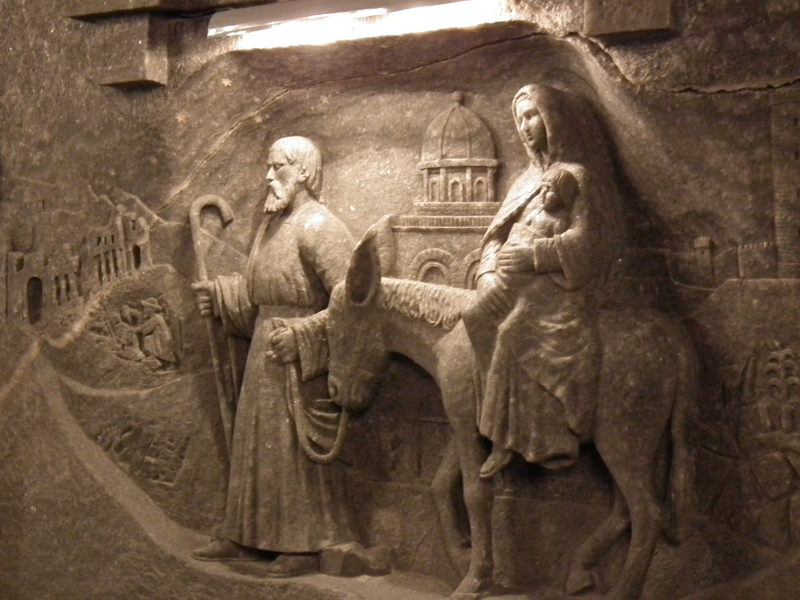 Jesus, Mary and Joseph 3-D carving in the wall. 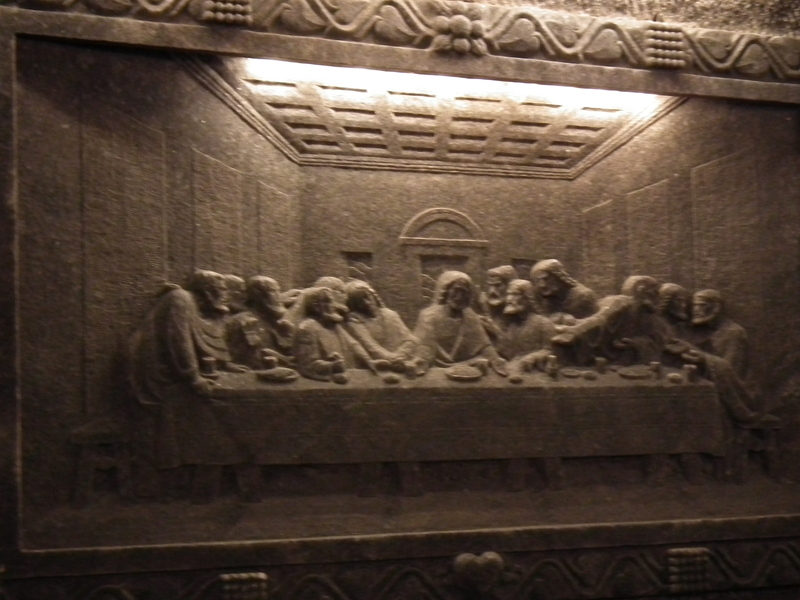 The Last Supper 3-D carving in the wall. 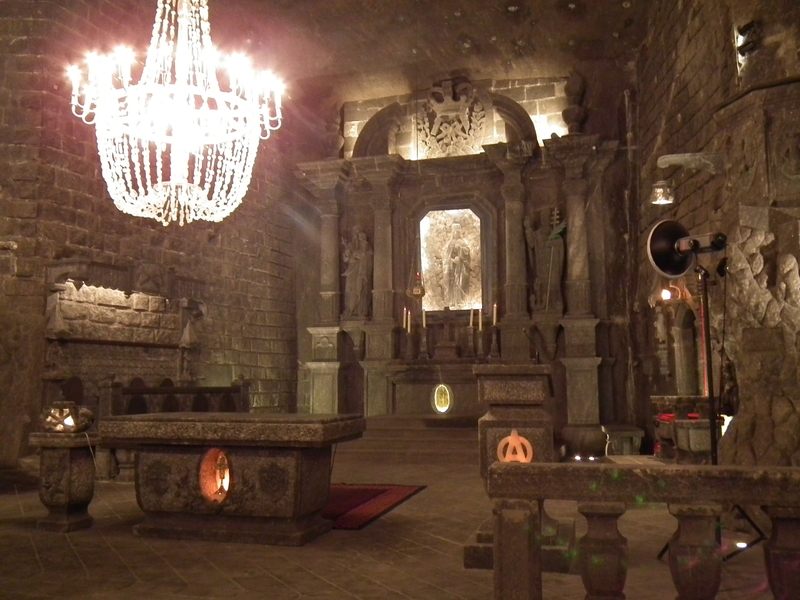 One of the 3 Chapels in the Mine – all made from salt. 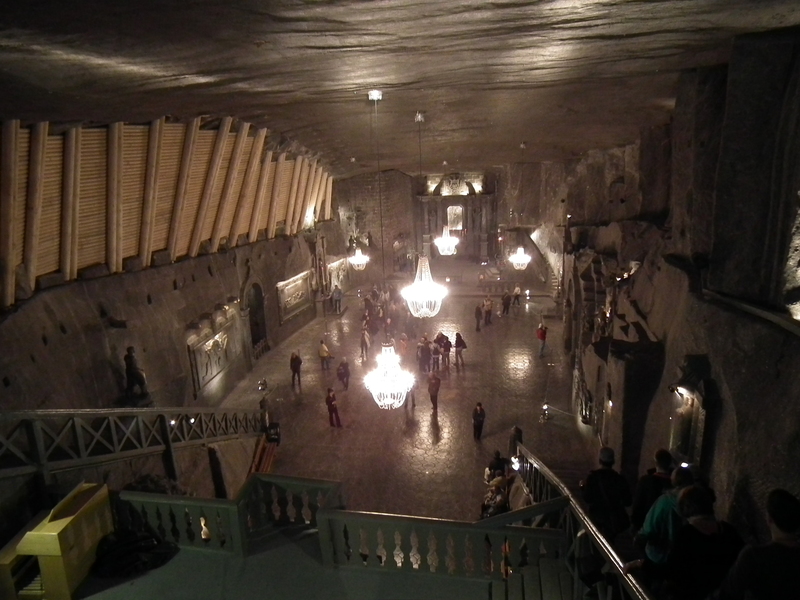 The chandeliers were also made out of salt in the chapels. 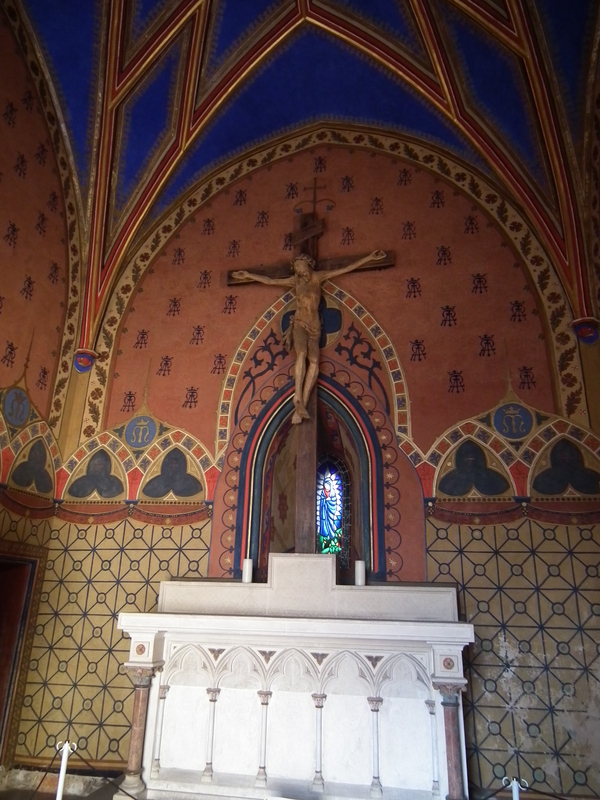 Chapel of St. Kings, which took 67 years to create in the early 20th century. 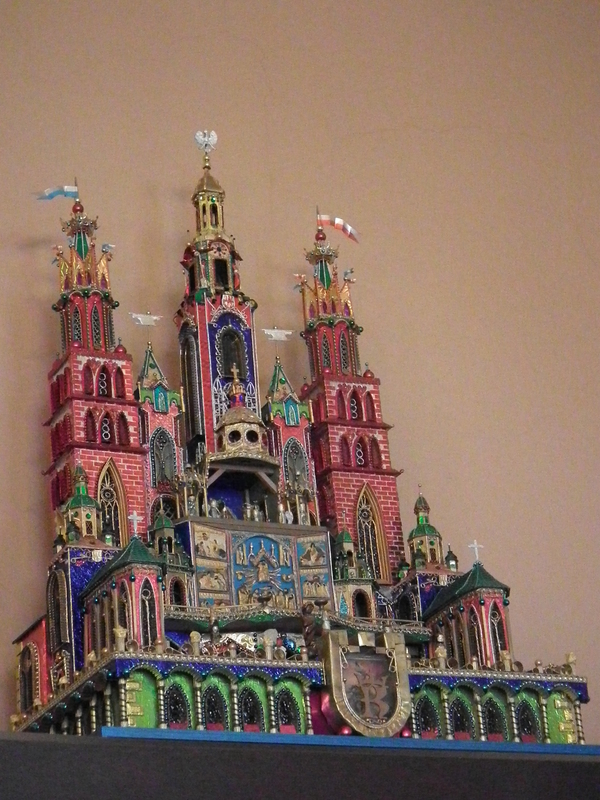 It is huge with carvings everywhere you look. 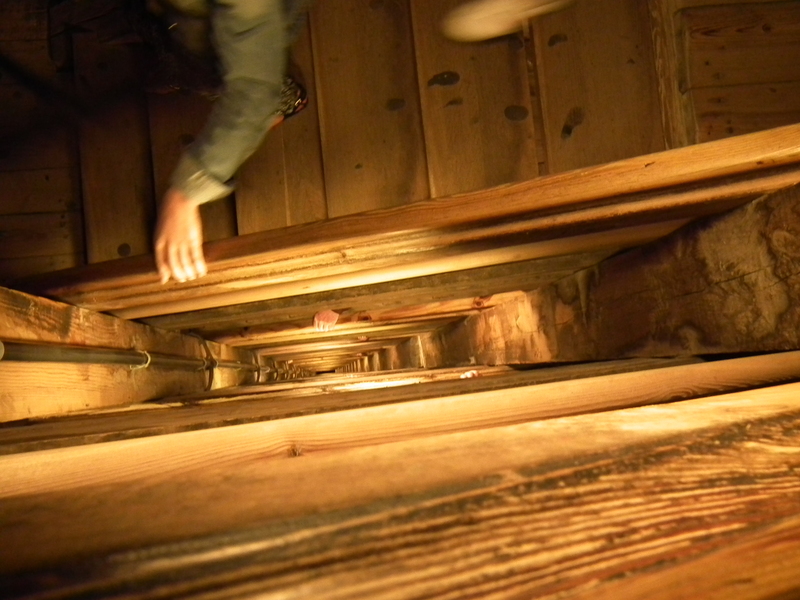 At the end of the tour, an elevator took 8 people at a time back up to the surface in 45 seconds. 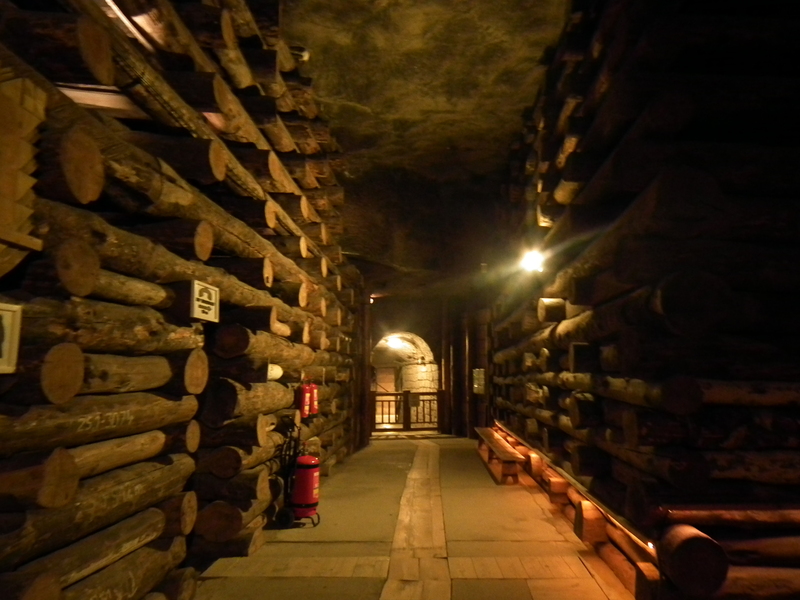 The experience was very interesting – seeing the underground lake, learning how the miners and horses worked underground and lived their lives hardly ever seeing daylight. But it also taught me that I would have never made it as a miner. God bless the men who can do this kind of work. 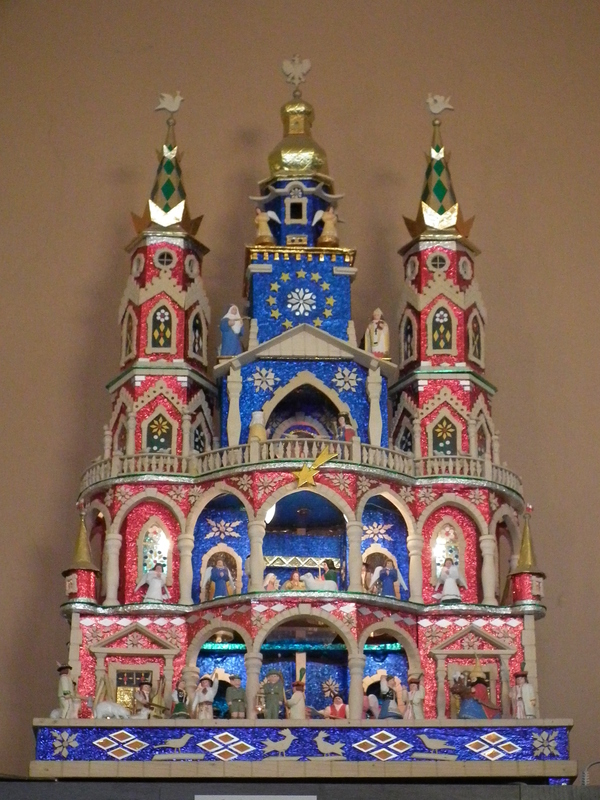 Originating in Krakow, is the Christmas tradition of making Nativity Cribs, or Szopka, as it is called in Polish. Back to the 19th century (excluding times of war) there would be and still are competitions for the creation of the best. 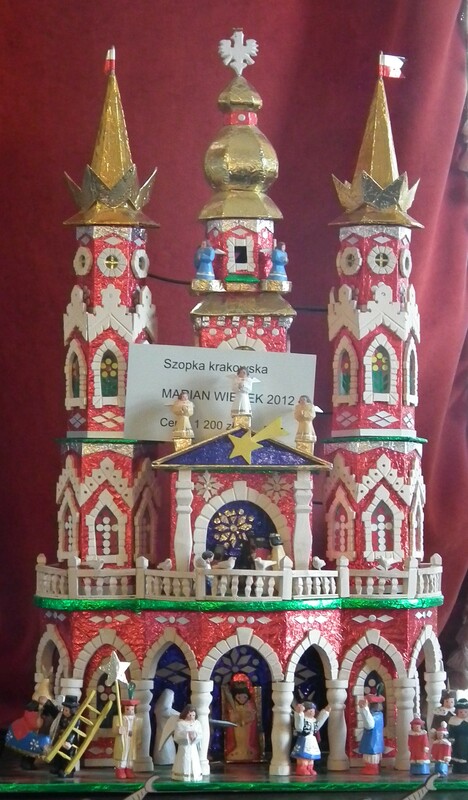 Anyone is welcome to compete and there are usually between 120 – 160 entries. 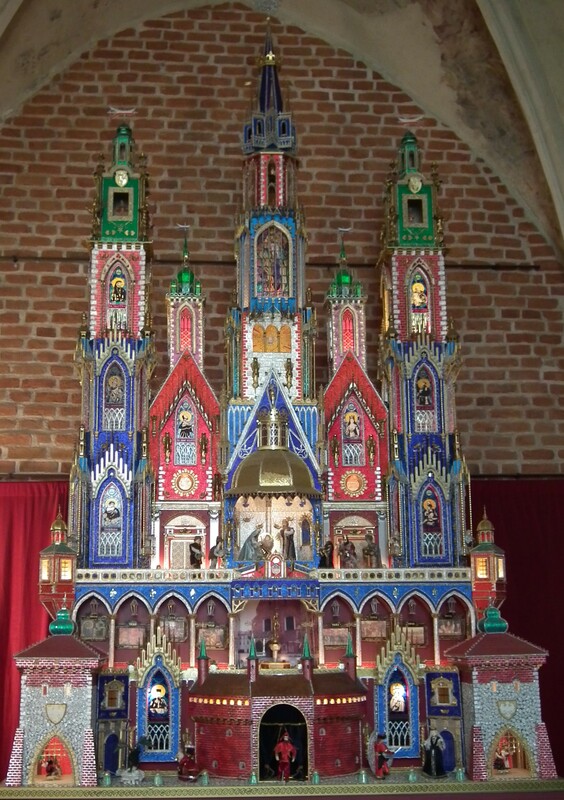 Each Szopka is a miniature recreation of the Nativity of Jesus using an architecture ( usually of a one of the city’s churches) of Krakow as the backdrop. 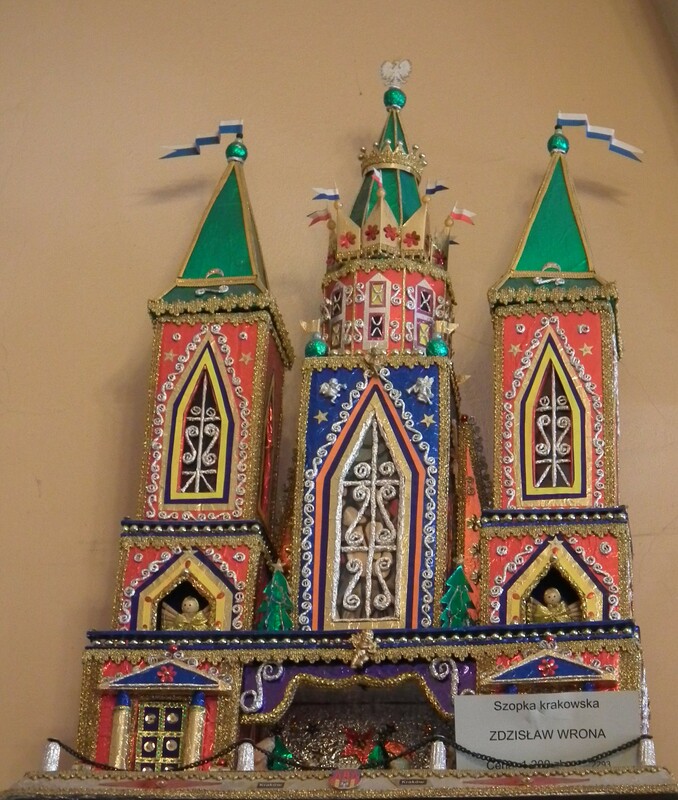 They come in all sizes and can be bought in one of the Museum Shops and sometimes where souvenirs can be found. 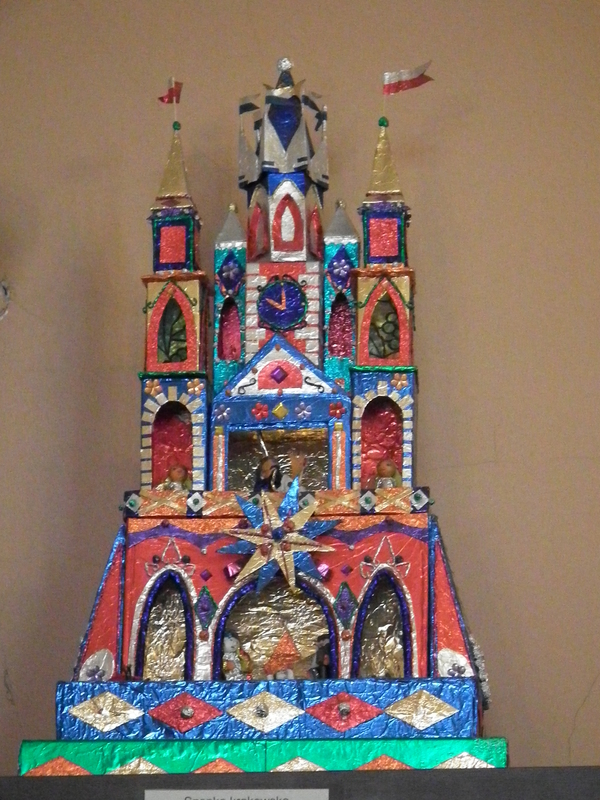 Some are inexpensive and some can be quite costly, depending on the size and the material it is made of. 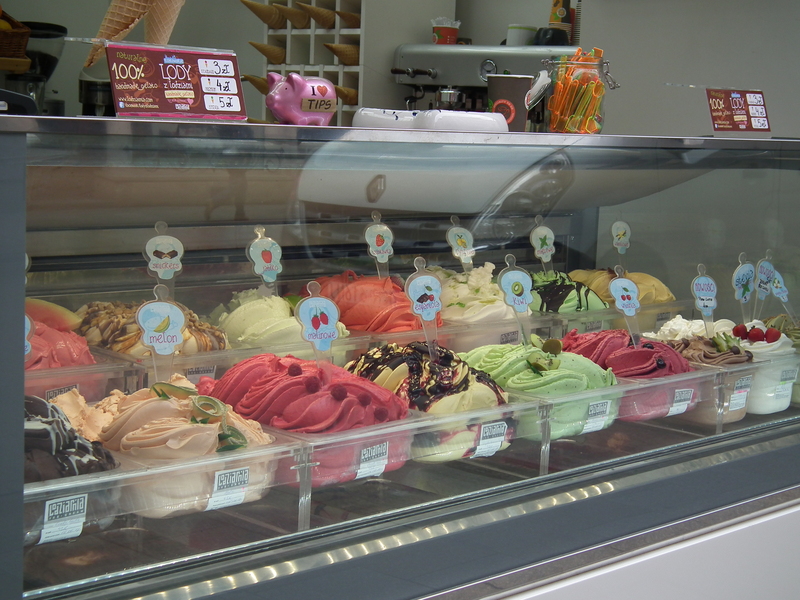 Hope you enjoyed them also! Thanks for reading ! 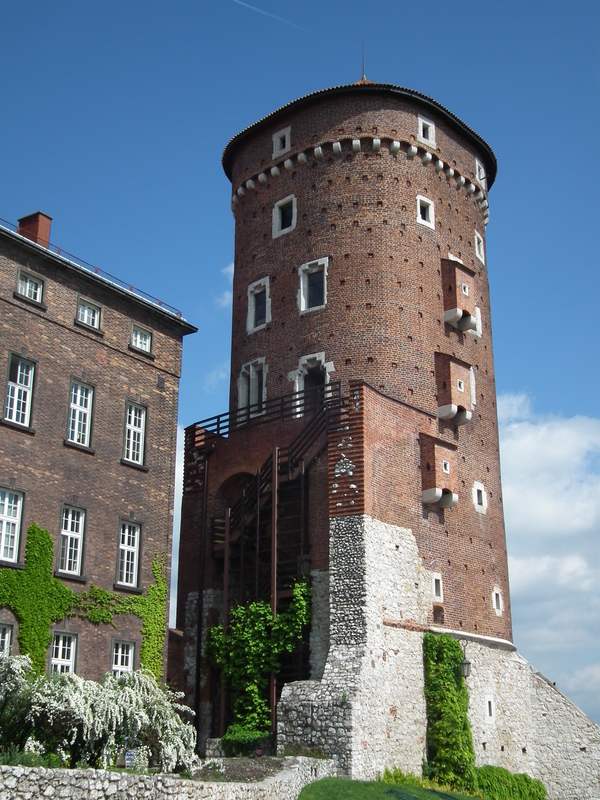 Krakow’s original rampart had 45 watchtowers and 8 gates. All with a moat surrounding the outside of it. 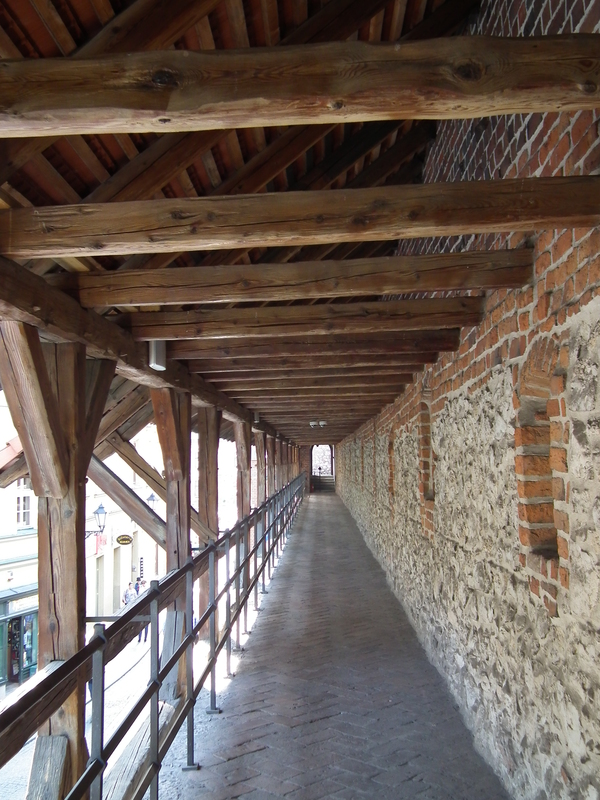 It was built in 1241-ish. 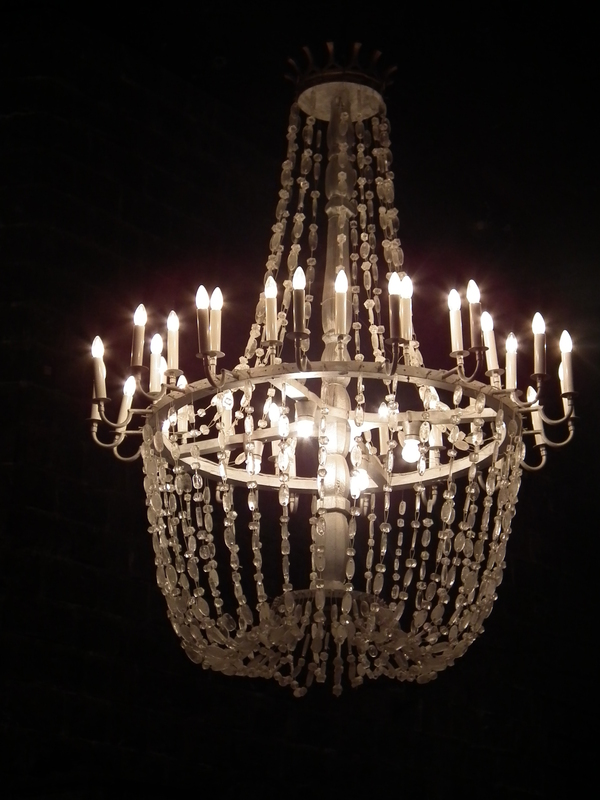 In the 19th century it had fallen in disrepair so most of it was torn down. The moat was then filled in, trees were planted and it was made into a park. So now the city has a wonderful park area that surrounds the Old Town area that is 2 and 1/2 miles long for walking, biking or just sitting on a bench and enjoying nature. 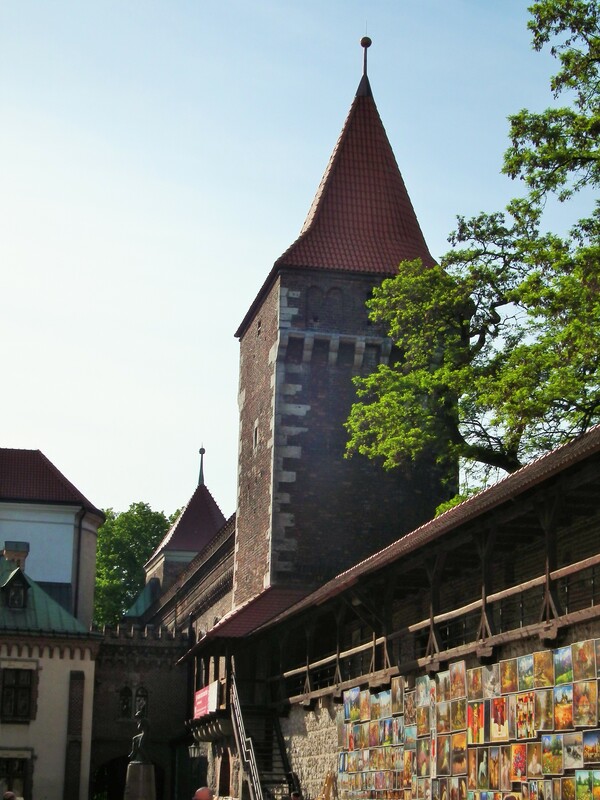 This is the Barbian Florian Gate which stood between the moat and the tower gate – as an extra layer of defense. 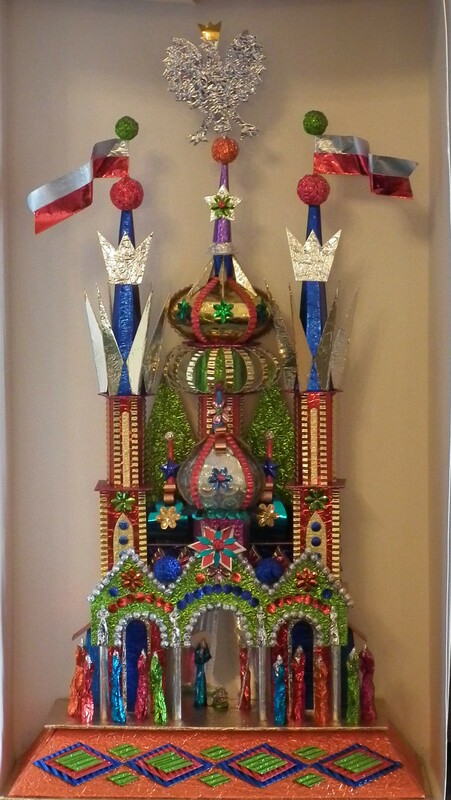 My 2nd daughter Corrine Zeller is beautifying the Barbian. 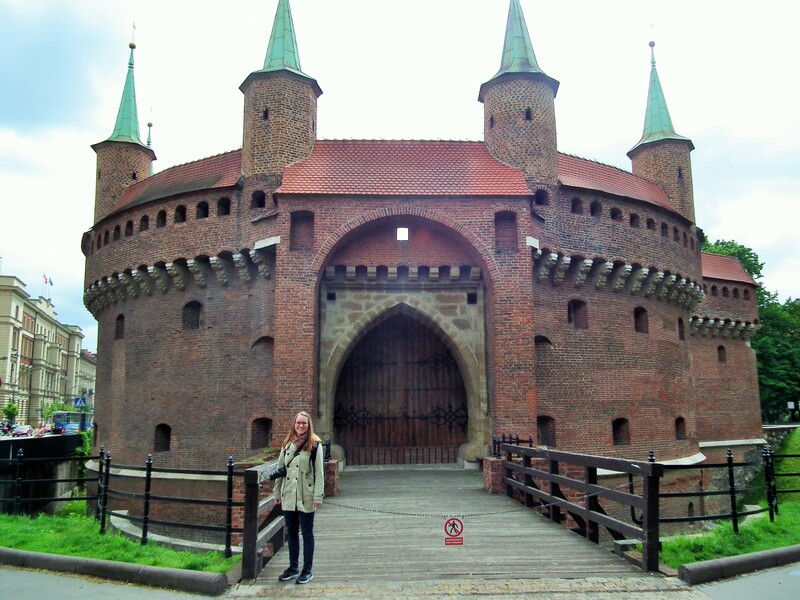 Corrine lives in Germany and I was lucky enough to have Corrine come join me while I was in Krakow. We had a great time exploring the city together. 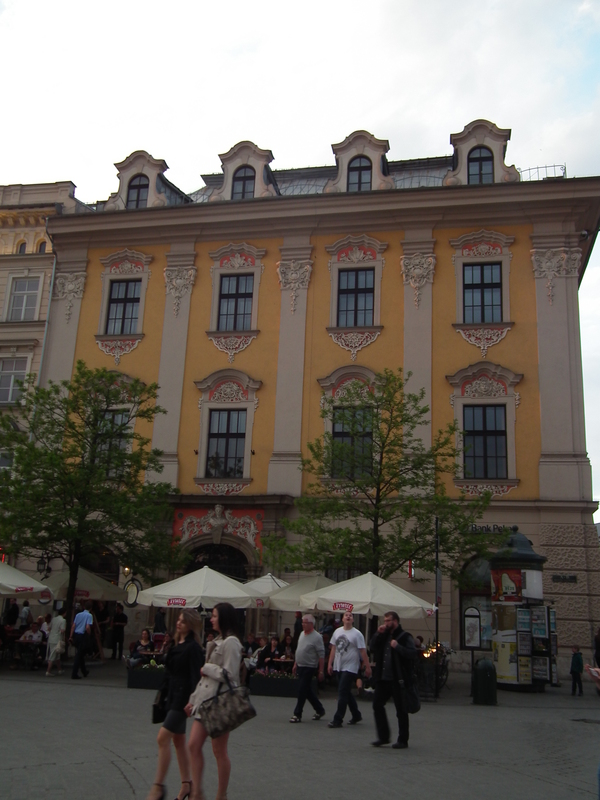 One side of the remaining wall is now used as an art gallery for students to sell their paintings. 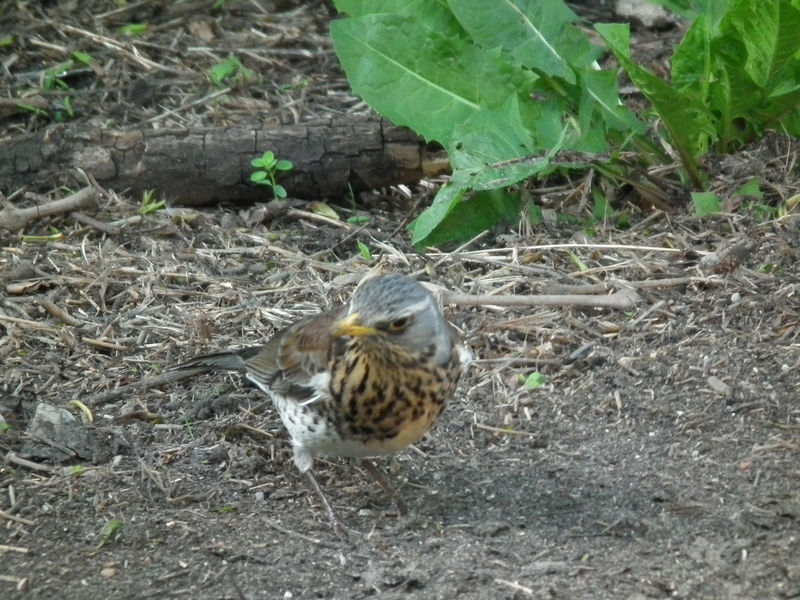 In the moat-made -into-a park area I found dozens of these pretty birds. Acting like Robins, they were pulling bugs and worms from the ground. 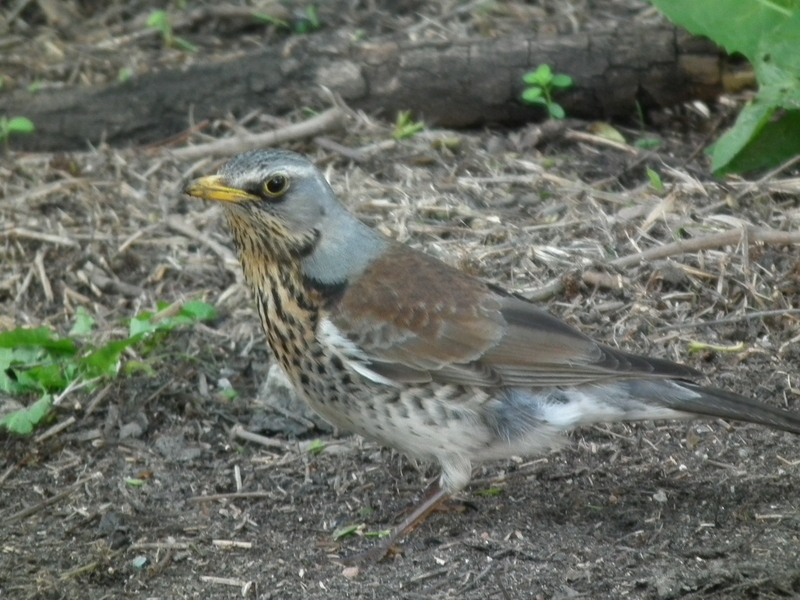 They are called Fieldfares, in the thrush family. 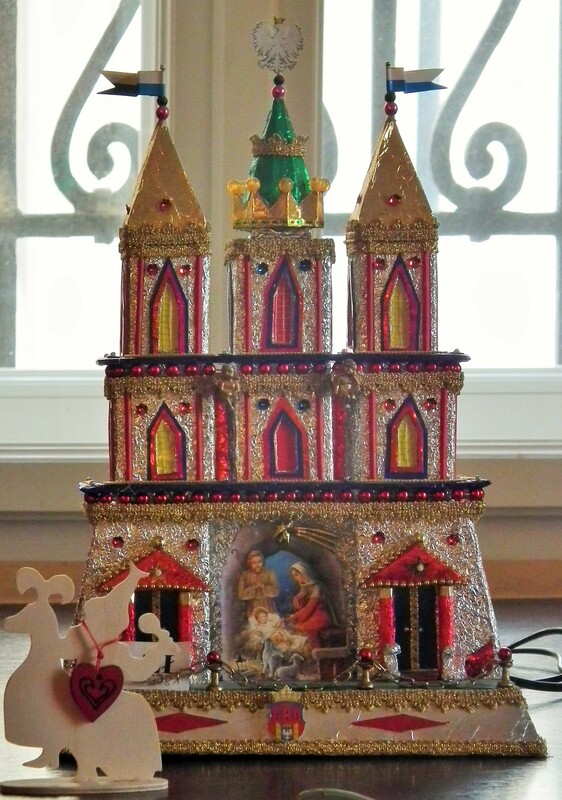 Next comes the Krakow Nativity Cribs…..